Door County features live music venues in every community. Birch Creek Music Performance Center is a summer music school in Door County, Wisconsin, for advanced young musicians. With a performance emphasis, students are taught by nationally-known performers and educators during the day, and perform alongside them in concerts at night. Free sunset concert series featuring nationwide talent on Sunday evenings in Egg Harbor. The venue is located just a short walk from the hotel. Please plan to attend the 64th season: August 2-20, 2016. 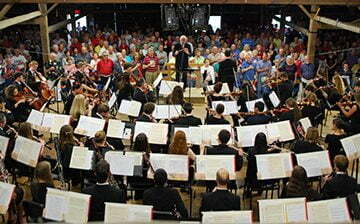 All nine symphony concerts are performed in the wonderful acoustics of the intimate Door County Auditorium in Fish Creek. The PMF Orchestra consists of outstanding musicians from around the country and the world, most of whom have been returning to the Festival for many years. Our concerts are held in a 100-year-old Door County dairy barn, which has been renovated to seat 150 people in our hayloft acoustic area (for solo, duet and trio acts), and 400 in our ground-level big stage area. Both concert areas feature independent state of the art lighting and sound systems, creating a personal and rustic setting for performers and audiences alike. Bringing the art of Chamber Music to Door County audiences for more than 20 years.